A Spanish judge on Thursday dropped European and international arrest warrants for deposed Catalan president Carles Puigdemont and other separatist leaders who fled abroad, the Supreme Court said, which means they no longer face extradition. In a court ruling, Pablo Llarena said he had taken the decision after a German court agreed to extradite Puigdemont, but only for misuse of public funds and not on the more serious charge of rebellion. This means that Puigdemont, who is currently in Germany awaiting extradition proceedings, and five other Catalans who are scattered in Scotland, Belgium and Switzerland, are free to move from country to country. The Spanish arrest warrant, however, remains open, which means they will be detained if they try to come back. Puigdemont is one of 13 separatist leaders accused of the most serious charge rebellion over their role in Catalonia's failed secession bid last October. Nine are in custody in Spain awaiting trial. Of those currently abroad, Puigdemont and three others are charged with rebellion and other lesser offences like misuse of public funds. The remaining two have only been charged with disobedience and misuse of public funds, but not rebellion. In its decision earlier this month on Puigdemont's extradition, the German court argued that the closest legal equivalent to rebellion, high treason, did not apply because his actions last autumn were not accompanied by violence. The decision meant that if he were to be extradited, Spain would only be able to try him on charges approved in the extradition order, and not rebellion. This in turn could have seen those jailed in Spain argue they too should not be tried on rebellion charges, which carry up to 25 years in jail, in what would have been a setback for Spain. 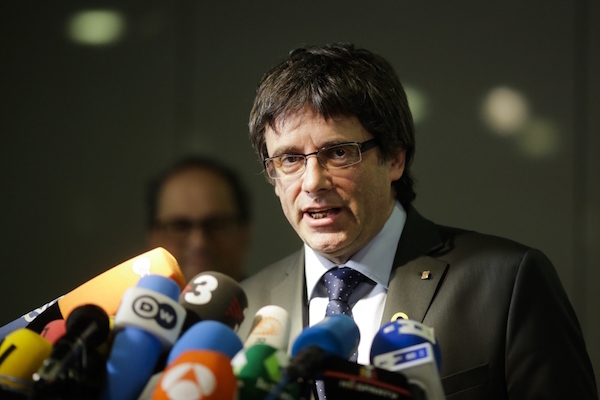 In December, Llarena had already dropped a European arrest warrant for Puigdemont and other Catalans who were then in Belgium. At the time, he had argued that Belgium could potentially reject some of the charges in his warrant -- just like Germany did earlier this month. This in turn would stop Spain from prosecuting the restricted offences, thereby creating inequalities with those already held in Spain who would face the full charges, Llarena had argued.